Please check your remote. 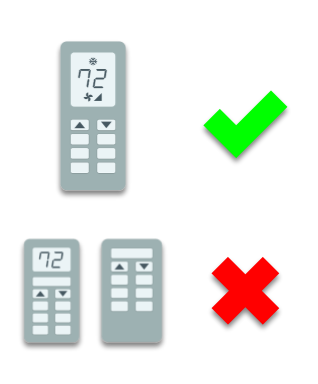 Fully compatible devices will display the set point temperature and fan speed. Flair works with DAITSU minisplits, window acs, and portables. Replace or upgrade your old remote effortlessly. Even your space heater or fan! If we don't have it, we will add it. Have a Minisplit system or a Window AC and want a smart thermostat? Puck is the only smart, wireless, and affordable option that works with these systems. Ditch your old-school remote. Sometimes, using a smart phone to do simple things like turn up the AC isn't so smart. You can control your AC from a different room, on your way home or on vacation. Loved by AirBnB Hosts and Guests alike! Auto Away, Preheating and Precooling. Flair turns your unit off automatically when you leave and even makes sure it doesn't get too hot or cold when you are away with our 'Smart Away'. Looking for a replacement remote? For almost the same price, a Puck can make your air conditioner smart. Also have a Central AC? Flair's sophistication automation lets you integrate and control your minisplit/ductless system with ecobee, Nest and Honeywell Lyric smart thermostats. Simplify your home energy management under one app. Beautiful homes deserve beautiful products. Wires aren't pretty. After your first Puck, every Puck is wireless. "Our mission is to bring meaningful energy reduction while improving comfort in people's lives."